Currently there are major challenges in data mining applications in the geosciences. This is due primarily to the fact that there is a wealth of available mining data amid an absence of the knowledge and expertise necessary to analyze and accurately interpret the same data. Most geoscientists have no practical knowledge or experience using data mining techniques. For the few that do, they typically lack expertise in using data mining software and in selecting the most appropriate algorithms for a given application. This leads to a paradoxical scenario of "rich data but poor knowledge". The true solution is to apply data mining techniques in geosciences databases and to modify these techniques for practical applications. 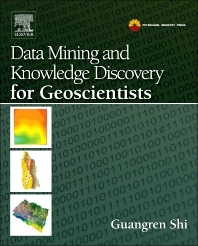 Authored by a global thought leader in data mining, Data Mining and Knowledge Discovery for Geoscientists addresses these challenges by summarizing the latest developments in geosciences data mining and arming scientists with the ability to apply key concepts to effectively analyze and interpret vast amounts of critical information. The primary audience includes researchers in data mining, and scientists and engineers in the geosciences. A secondary audience includes scientists and engineers in computer science and information technology, and graduate students taking related coursework.